Nazli Nahidi, Mural Routes Program Assistant, interviewed Artist, Traditional Wisdom Keeper & Historian: Philip Cote on October 12, 2018. Mural detail: 8th Fire at Garden & Roncesvalles: Photo credit – Nelly Torossian. Your work is often centered around animal figures such as birds, turtles and many more. What makes these animals significant and what do they represent? They represent the Indigenous land-based pedagogy – a lot of knowledge is learned from the animals as part of our storytelling. They’re incorporated into every level from our physical level here on earth, to our spiritual level, and so a lot of analogies and lessons in life are learned through telling the stories of animals. You call yourself a traditional wisdom keeper, what does this mean? Basically this means that I’m a cultural interpreter and also a young elder. I was recognized as a young spiritual elder elder a couple years ago meaning that I can transmit a lot of knowledge connected with our rituals and ceremonies. I can understand those rituals, know the history of them and understand what they mean in terms of the metaphysical narrative that comes from Indigenous culture. Another signature element of your work is the narrative that it often conveys and you often teach stories in your career as well. Why is teaching important in your practice? I think it’s because I wear a lot of hats – I wear a hat as a teacher, a leader, an Indigenous person, a person to participates in culture and also I belong to different societies. For example I belong to the Sundance Society, I belong to the Eagle Society and each one of these requires you to know and understand things to be part of them so that you can pass on knowledge. It’s not far from what I normally do, to be a teacher as well as an artist. For me, I think a lot of my artwork is based on spreading knowledge, it’s not just about creating a pretty picture. There’s a lot of meaning behind what I do and it gives me an opportunity to share that knowledge, and in a way these images I’m creating in effect work to decolonize stereotypes built around indigenous people. The only way people will know different stories about Indigenous people is for others to tell them. Being an Indigenous artist and having established a robust career as an artist, what are your thoughts on the progression of visibility and opportunities available for Indigenous artists? You know, I think my role as a scholar really gives me a deep understanding of what that means. Like how do we transform a colonial setting into an Indigenous setting – because Indigenous people have such a long history being here in North America and a lot of people just don’t know the extent of this. We’re always being misrepresented by the colonial archives and the educational system as well. So for me, to change that stereotypical view of who Indigenous people are is my ongoing privilege and task – shaping that view through my artwork and through my scholarly efforts, and for me, those stories are oral histories. These oral histories in many ways are more accurate than colonial histories in terms of the our history on the land and various migrations that the different nations had through this territory. Going as far back as archeology in terms of being able to share from a western perspective. Archeology says that Indigenous people have been here in [North America] for about 12 thousand years. Around 1985 a discovery was made on Manitoulin island. Carbon dating wasn’t working for them and they had to find another way to test the tools they found there to see how old they were. I can’t remember the name of it but once they did find a way to test this, they found that these tools were 130,000 years old. So that breaks down a lot of barriers that have been put up through the educational system about how long we have really been here. For the longest time the mainstream theory was that Indigenous people only arrived here 10-12 thousand years ago. However, no Indigenous people say that they arrived here. They’ve always been here – there are stories that say they came from the sky or from the earth but we don’t have a story about migrating here across a great trek and arriving to a new world or new land. So this story is actually a western story that follows their view of our history. There is another marker of our history and that is language. There are over 500 languages here in North America and there are 15 distinct ones. These 15 distinct ones take about 15,000 years to form. So what we see here are migration patterns of people who are travelling across the land and settling in different parts and creating new languages. Just like here in Ontario we have the Algonquin language and there are 24 different nations that speak that language and we also have the Iroquoian language where we have 10 different nations speak that same language. Is this knowledge that the younger generation of Indigenous artists usually know? No, they don’t know this. So I’m constantly updating people that I associate with and I try to change their limited depth of understanding on our longevity in North America. I do this through sharing stories and I share these stories wherever I go. I work in the TDSB and I like to talk about these things to break down a lot of the ways that the teachers have been trained to speak about it. And so lots of times there’s misrepresentation and I’m going to be the first one to correct them. I think that’s great (laughs). Yes, I guess somebody needs to! Can you tell us about a mural or public art project that you did recently or are particularly connected with and tell us a little about its meaning? I could talk about the one I’m working on right now which is basically the story I just told you. The mural on Roncesvalles – who I’m working on thanks to my talented painting assistant, Nelly Torossian. 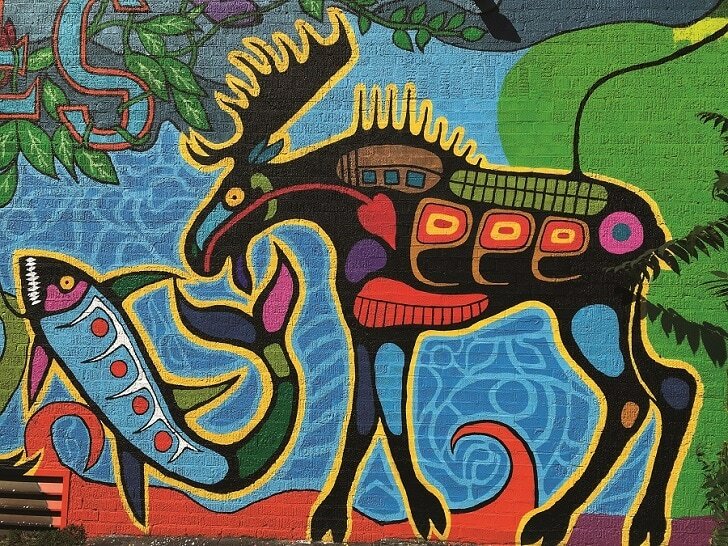 This mural really has a lot to say about these things and the purpose is to teach people about who Indigenous people are and break down the mythologies that have been built up around settlement. It talks about the first people here who were described in the creation story of the Anishinabe people. And it talks about their traveling across the land and their incorporating the wisdom of all the animals on that land starting with that understanding of the land based pedagogy. So what that means is that each living thing can offer human beings a really good observation. Our ancestors looked to the world for knowledge on how to survive successfully because if you look to every animal in North America, they’re all successful. And the reason that they are is because they know their territory really well and they know how to find medicine and keep themselves safe from danger. And so Indigenous people have been watching and observing their strengths and weaknesses for a long time and one of the animals that really stands out for indigenous people in particular is the bear. For Indigenous people, that bear is a symbol of medicine people and symbol of following a path or journey. The bear marks its territory by following its tracks by foot, and they have such an acute sense of smell they can find the medicine they need if they’re not well. And when bears are in hibernation, they don’t eat or drink and when they wake up they search for medicine to clear their bodies and Indigenous people have been watching them so they are the epitome of the first medicine people. So that’s one of the animals that’s on mural. I also have a Thunderbird on the mural and the Thunderbird is really significant because its regarded as a co-creator meaning that the Thunderbird has the ability to create life on earth – according to the stories that are told about them. And the story of how the Thunderbird came to being starts a long time ago before the first humans arrived here on earth. There was a giant bird – we can call it the red-tailed hawk – and this hawk flew out over the land with its 30-foot wingspan. All the animals really admired this bird in its beauty and even the creator looked down and admired this bird so much that he decided to give that bird the power of creation. The caveat was that the bird must build an altar for the creator to show his appreciation for the power of creation. The bird agreed to do so, and went ahead and started to create more and more life on earth without fulfilling his end of the agreement. So after some time, the creator instead of punishing him, sent the thunder beams down to look after that red-tailed hawk. And the thunder beams came down and they took him to live in the sky with them and from that moment on he became known as the Thunderbird. So what the moral of the story is: never forget where you got your gifts from because each one of us have gifts that have been passed down from generations. They’re as much part of our ancestry as they are part of us. And so there are two Thunderbirds on the mural and of course there is also a man and a woman. There are also fish, who are guardians of the underworld, there’s a flower which represents all the connections of all the people and of course there’s a moose, buffalo, rabbit, and squirrel and of course the bear. There are stories embedded in each of these animals – and that’s how it is in real life. What is your design process when creating new work for public art? I guess I have a lot of resources, practical knowledge and experiential learning. I have different ceremonies that I participate in and also ones that I lead. I’m a sweat lodge leader, I’m a pipe carrier, and I’ve been following our culture since I was 17. I wasn’t born into it, I researched it. There were a couple of generations where our ceremonies and everything was outlawed. We couldn’t actually practice any of them until the 1960s when Canada decided to lift the law considering our ceremonies an illegal act and even our language was considered an illegal act. This is why Indigenous people don’t know how to speak their own languages. Your work ranges from painting, design and sculpture. What makes murals a necessary medium for you as well as all the other work you do? Because they’re a way to continue our culture practice which is storytelling. Storytelling is an important way in which our knowledge is handed down generation to generation. It’s a good way for people to begin to ask questions about what all these stories mean – like why are all these animals associated with Indigenous storytelling. It gives people an opportunity to be open, a visual story so that you know where to start now – when you see an Indigenous person you can know what to ask them, and maybe learn from them. And in the process be decolonized, which a lot of people need to do. There are a lot of people out there who are in the middle, through no fault of their own. It’s just because of the way in which colonialism crossed the continent and committed cultural and physical genocide across the nations. People don’t hear this word associated with us here, but it happened through colonialism. A lot of Indigenous people wiped out. Colonists arrived and by the year 1900, 50 million native people were wiped out and nobody ever talks about this story – it’s very real. Part of that genocide was in the form of residential schools. There was a recent event at city hall in which I created two teepees for and it was called the Indian Residential School Survivors. And so they had a celebration there to help people understand that we know what happened to them and we care about their experiences. So we had a celebration and I was asked to create two teepees out of 21 total, to honor that. So I did one for Council Fire and the other one was for First Nations school. One thing it talks about is Indigenous people being very resourceful with the buffalo – and how the colonizers wiped out the buffalo. Yeah, I think just being in the arts industry, I have heard some of these stories but I think especially in mainstream culture most people are not aware of the genocide that occurred. Yeah if people would like to learn more, there’s a good book called Rebellion by Ward Churchill. There’s another one called Prison of Grass by Howard Adams, if you want to know more about what I’m talking about, those are excellent books to read. One of the ways of decolonizing indigenous people is learning about the history. Louis Riel is also a political leader to look into. What advice would you give young Indigenous artists who are just starting out? I would say always keep your mind open, especially when it comes to understanding the cultural practice. I would also say, find an elder – if you’re going to be claiming yourself as an Indigenous person, figure out what an Indigenous person is if you don’t know. There are lots of pathways. One of the ways we would find a pathway is we would observe the bear. So now we’re in this transition of going back to our culture again. Another way of finding your pathway would be participating in those ceremonies. For Indigenous people not participating in your culture means you will never have a deep understanding of what it means to be Indigenous. The only way to understand is to practice your culture. They can’t read about it or hear stories about it, they actually need to do it. Because that physical activity, that experiential learning – it ignites this blood memory. And the blood memory is where all our ancestral knowledge is contained. So even if things go missing because of generational gaps between the last people that really understood – and now is irrelevant because somewhere through that practicing the culture, the knowledge will resurface in those people. What do you think is the value of having a Mural Routes membership? For me to have a membership is about being part of a community and it’s a way in which you can have a place to kind of tell your story and connect with other artists who are basically trying to do the same thing. I think every artist is trying to tell a story of some kind and if it’s not about history, it’s about their place in society. Because a lot of artists do feel like they are kind of outside of everything and from a traditional perspective that is the role of the medicine people because many medicine people are outside the community. The reason that they’re there is so they have a better perspective on what’s happening. Artists are the avant-garde, they are on the edge and they’re looking at the issues coming over the horizon and they put these issues out into the world and the world kind of digests those things and moves forward. Check out The Celebration for Philip Cote’s new mural, on October 20th at 11am at Garden Avenue & Roncesvalles (North East Corner Wall).